You can Hook up an ordinary PC, a Kantronics radio modem, and your radio, and then send and receive e-mail, transfer files, monitor remote operations, and use numerous other packet radio applications. 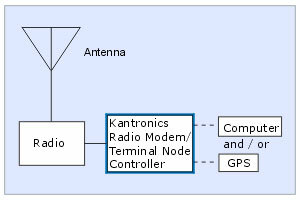 You can connect a GPS receiver to a Kantronics radio modem and a radio to create a location transmitter for tracking applications. You can use the Kantronics' radio modem's A/D inputs to sense critical conditions such as temperature or pressure and then use the modem/TNC with a radio to transmit this information to another location. Additionally, the TNC (Terminal Node Controller) capabilities in Kantronics radio modems enable you to "plug into" radio networks. With a Kantronics radio modem/TNC, your radio becomes a fully operational network node, able to communicate on virtually all popular protocols. So you can set up a simple, efficient radio network with K-NET™ or connect to the Internet with TCP/IP. System diagram of site with radio modem As shown in the diagram, a radio modem/TNC extracts digital data from the analog (received RF audio) signal of a radio. The digital data is then processed according to the modem's current mode and protocol. Successfully received data can be stored for later access, passed on to a local computer, or retransmitted to other sites, extending the range of a radio network. The radio modem also encodes and packetizes data from a local computer or GPS receiver (or analog sense inputs). Encoded packets are then sent to the radio for transmission, with the modem enabling the radio's transmit mode. Kantronics' radio modems (also known as packet modems, since they are most frequently used in packet-based communication modes) convert radios (HF/VHF/UHF) into digital communications devices especially well suited for packet radio communications. Hook up an ordinary PC, a Kantronics radio modem, and your radio, and you can send and receive e-mail, transfer files, monitor remote operations, and use numerous other packet radio applications. Connect a GPS receiver to a Kantronics radio modem and a radio to create a location transmitter for tracking applications. Use the modem's A/D inputs to remotely sense critical conditions such as temperature, pressure, etc. As shown in the diagram, a radio modem/TNC extracts digital data from the analog (received RF audio) signal of a radio. The digital data is then processed according to the modem's current mode and protocol. Successfully received data can be stored for later access, passed on to a local computer, or retransmitted to other sites, extending the range of a radio network. The radio modem also encodes and packetizes data from a local computer or GPS receiver (or analog sense inputs). Encoded packets are then sent to the radio for transmission, with the modem enabling the radio's transmit mode. The TNC (Terminal Node Controller) capabilities in Kantronics radio modems enable you to "plug into" radio networks. With a Kantronics radio modem/TNC, your radio becomes a fully operational network node, able to communicate on virtually all popular protocols (see the table below). Set up a simple, efficient radio network with K-NET™ or connect to the Internet with TCP/IP.